As an advisor, you know the value of LinkedIn as a prospecting and networking tool. But many find it overwhelming and miss the opportunity to integrate LinkedIn into their weekly routine. Here’s a great way to create a “5-5-5” weekly strategy. Start with 5 names of existing LinkedIn connections and contact them to check in on a topic unrelated to your business. Offer congratulations on new role at a company, a job change, or a work anniversary, or comment on some of their recent LinkedIn posts. Vary your method of contact: Sometimes a phone call is in order, and sometimes responding directly through LinkedIn is more effective. Select 5 names of prospects to contact by phone or email. You can find these among your 2nd connections on LinkedIn. 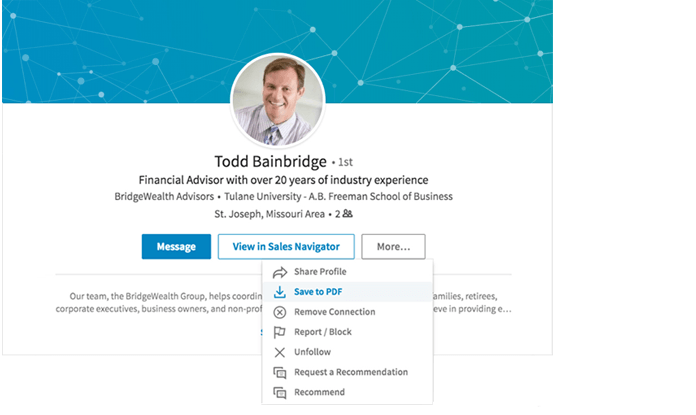 Create a file that includes the prospect’s job title, a printout of their LinkedIn profile/resume, and connections you share with the prospect. PRO TIP: You can easily save any LinkedIn profile to a resume-style PDF. Simply click on “More…” on their profile and select the “Save to PDF” option. Identify the beneficiaries of 5 clients you will be seeing for upcoming meetings. You can find beneficiary names on investment and insurance forms, and cross reference those names with LinkedIn to identify potential social connections. Prepare to ask the clients about reaching out to their children/beneficiaries through LinkedIn, making sure that they know it is a business networking site. This will not only allow you to expand your network, but could also help with multigenerational planning opportunities. Be sure to add context when you reach out on LinkedIn. The 5-5-5 approach can be reviewed each week, and the preparation and updating can be managed by a customer service associate on your team.